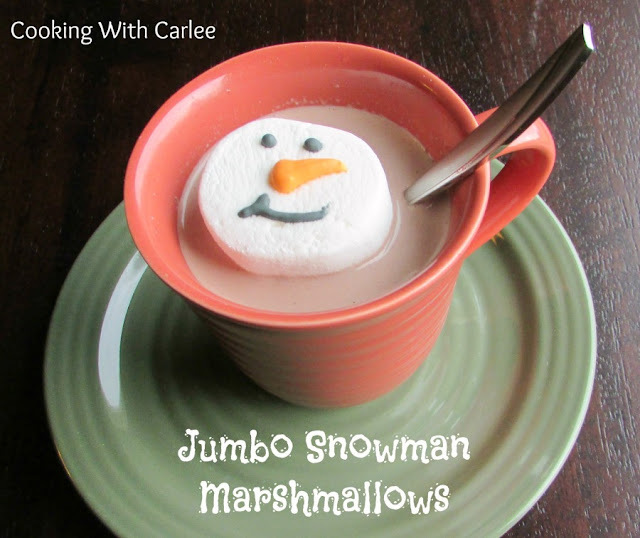 Cooking With Carlee: Jumbo Marshmallow Snowmen, Perfect for Your Hot Chocolate! 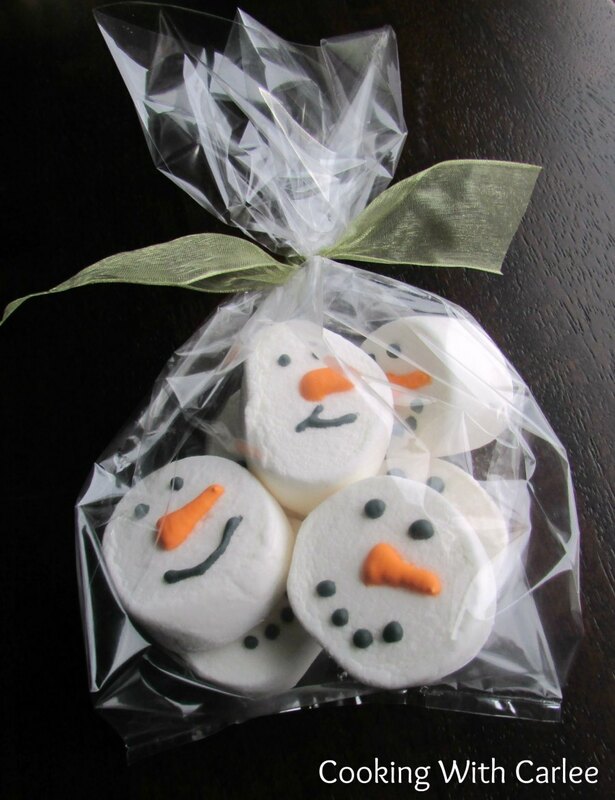 Jumbo Marshmallow Snowmen, Perfect for Your Hot Chocolate! 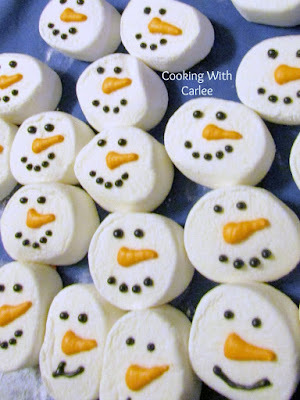 Simple and cute, these jumbo marshmallow snowmen will make the cutest cup of hot cocoa you've ever had! I think hot chocolate is one of those special drinks. All that smooth, sweet and creamy warmth in a mug just feels like a smile. So why not go ahead and give it a smile?! I just love dressing it up and making it feel just that little bit more special. These are so easy to make and really do up the cute factor of your cup of cocoa! All you have to do is cut your jumbo marshmallows in half. Dip the cut sides in powdered sugar to keep them from sticking to everything. Pipe on orange royal icing for the carrot noses. Then pipe on black royal icing for the eyes and mouth. Don't be afraid to get a little creative if you have some fun ideas! Even people like me who aren't so creative can pull out a few variations. It is fun to see their little personalities come through. As much fun as it is to have a bunch of mini marshmallows floating in your cup of cocoa, a giant snowman face is even better! 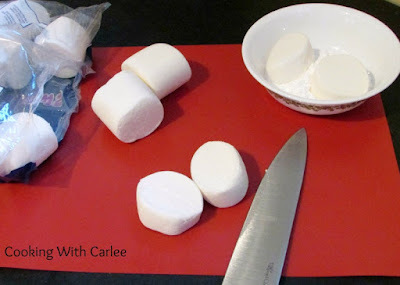 Cut marshmallows in half. Dust the cut sides with powdered sugar. Dye some icing orange and the rest black. 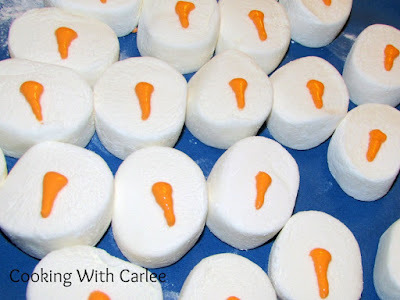 Spoon into piping bags or sandwich bags. Either cut a corner out of your bag, or use a small round piping tip to pipe on the eyes and noses. Let sit out at least overnight so the icing can set, then store in an airtight container until ready to use. We have really been enjoying them! We gave hot chocolate and an assortment of marshmallows to all my siblings after Thanksgiving and they have been texting me pictures of their snowmen in a warm bath of chocolate! I think you'll get over it pretty quickly with a mug of hot chocolate appears next to the marshmallow! I had never had hot chocolate with one giant marshmallow before, but now I don't think I can go back to the little ones! I love the one big one! Thanks for hosting! Pinned to my crafty board! This is supercute. Thank you! They were fun to make. My little guy loves them and my siblings have been texting me pictures of their hot chocolate with a snowman on top! My Granddaughter Addy would live this!! Thanks for sharing on My 2 Favorite Things on Thursday! Hope to see you again! Pinned! They were so much fun to make and even more fun to use in our hot chocolate! Thank you! You are right, no heat required... just fun! These are adorable!! Totally going to try making these. My kids will love them. Great idea for a gift. Yay! They were a hit here and so much fun to do in little gifts with hot chocolate. I hope you love them!